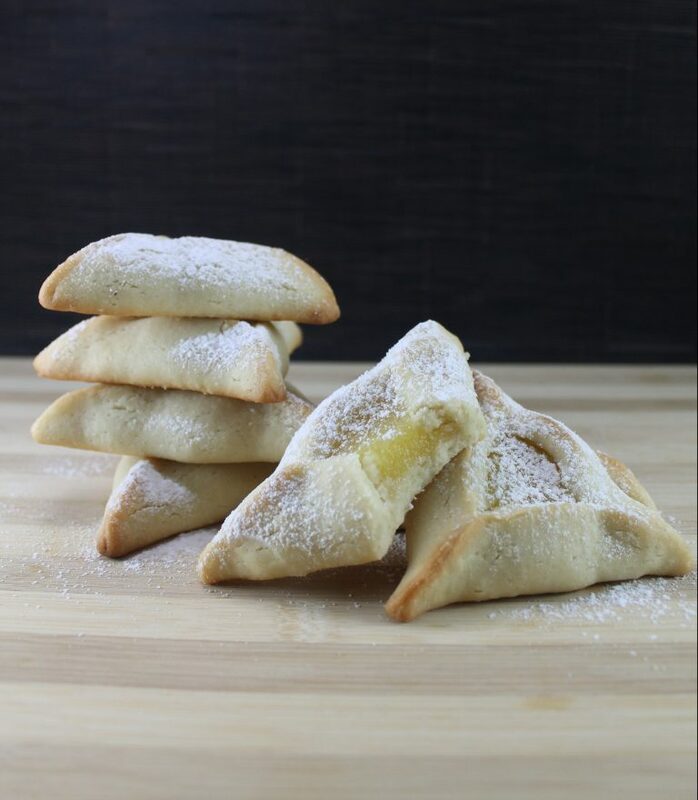 Lemon Bar Hamantaschen (Easy Lemon Curd and Dough!) - No Way That's Healthy! You either love them or you hate them. Lemon bar fans will go nuts over these hamantaschen. They are everything you love in lemon bars, but in its own Purim costume! For those who aren’t lemon fans, this dough is perfect with any filling. Crispy on the outside, soft on the inside and delicious all around. Oh, and it’s only 5 ingredients, uses oil, and no refrigeration needed! No need to patchke over the stove top, this microwave lemon curd comes together so quickly and is bound to become your go-to lemon curd recipe. I’m sure you can make it over the stove top as well (just whisk the ingredients over med/low heat), but I wanted something quick and simple. If you try any of my recipes please be sure to tag me @nowaythatshealthy and/or comment below! I’d love to know! Whisk together the oil and sugar. Add in the eggs and whisk till combined. Mix in the flour and baking powder using a spoon. The dough should easily come together into a ball. It may require more flour, but be sure you do not add too much. You want it slightly sticky to ensure the edges stay closed. Lightly flour the surface you will be rolling the dough out on. Roll out the dough to ¼-½ an inch thickness. Use the rim of a glass cup or round cookie cutter to cut rounds of the dough. Place onto the baking sheet then place two teaspoons of lemon curd in the center of the circle. Pinch together the top and then bottom two corners creating a triangular shape. Bake for 15 minutes or until the tops become slightly golden. In a microwave safe bowl whisk together all the ingredients. Heat in the microwave for one minute. Remove and whisk. Continue microwaving for another 2 ½ minutes removing every 30 seconds to whisk. Each microwave is different, but it will begin to thicken. Once it is thick enough to only slowly drip off the spoon, it is ready. It will also thicken more as it cools. Can I make the lemon curd on the stovetop? Do these have to be refrigerated? I make hamentaschen annually and ship to family members. no they don’t. They will love them!! Would you recommend freezing after baking or just making the dough and freezing it and making then ready to assemble? Thanks! After baking should work, but they also last pretty long out. My dough was too oily the first time i made it which made it hard to shape. I reccomend using 1/2 cup of oil in the dough instead of 1/3 cup. I also baked mine for 20 min (but it varied with each oven). Overall great recipe. Each one came out beautiful! It could have just needed more flour then. Sometimes I need a lot more flour, depends on the day I guess. But glad it worked out in the end! Can I use spelt or whole wheat flour? I haven’t tried but you can. If you want a healthy recipe I have one on my blog. Rena, the recipe worked exactly as you wrote it and the results were the best Hamantaschen I’ve ever tasted. I only need 2 1/4 cups flour, so you gave good advice when you gave the range. The dough came together very easily! I used a 3″ diameter glass and made 26 Hamantaschen. I have to say, I am a huge fan of everything lemon-flavored. This lemon curd was so easy to make and absolutely delicious! I’m already thinking about all the other recipes I can use it for! Thank you so much for sharing this recipe! I’m so glad to hear that!! We love them too! Your recipes look great and I would love to try them, but I really need nutritional information. Especially carb content. Anyway you could provide that? Hi! You can use a recipe calculator. I think Sparkpeople has one.